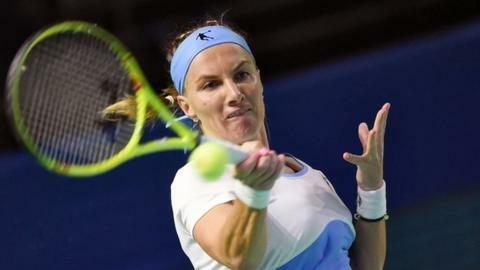 Svetlana Kuznetsova is one win away from denying Britain's Johanna Konta a place in the WTA Finals after reaching the final of the Kremlin Cup. Konta, 25, occupies the eighth and final slot for the tournament which starts on Sunday in Singapore. Kuznetsova must win Saturday's final to overtake the British number one, who is not playing this week as she continues to recover from an injury. The 31-year-old Russian will play world number 49 Daria Gavrilova in the final. Australian Gavrilova defeated Germany's Julia Goerges 7-5 6-1 to set up a meeting with top seed Kuznetsova, who beat Ukraine's Elina Svitolina 6-1 6-7 (1-7) 6-4. Konta moved up to eighth in the rankings following the withdrawal of world number two Serena Williams. BBC tennis correspondent Russell Fuller said she has arrived in Singapore, and appears fit to play. Konta was present for the WTA Finals draw in Singapore on Friday, when she was named most improved player for 2016. If she qualifies, she will face Agnieszka Radwanska, Karolina Pliskova and Garbine Muguruza in the group stage. Angelique Kerber, Simona Halep, Madison Keys and Dominika Cibulkova line up in the other group. Kuznetsova is the only player who can deny Konta a place at the Finals, because ninth-ranked Carla Suarez Navarro retired with a wrist injury after round two of the Kremlin Cup.